Tort Talkers may recall that the Post-Koken case of Wissinger v. Brady, out of Luzerne County, went up on appeal to the Superior Court and was submitted on briefs for the court to address the issue of proper venue for Post-Koken cases where there is no forum selection clause in the UIM policy at issue. There has been no decision handed down in this matter to date. 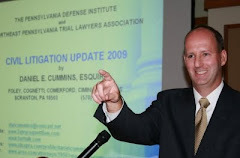 By way of status report, I also note that the Plaintiff in this matter recently filed with the Superior Court a Motion to Discontinue, Dismiss, and Remand the matter to the Luzerne County on account of the fact that the Plaintiff has entered into a settlement with the third party tortfeasors (and thereby apparently eradicating any venue issues under an argument that an insurance carrier can be sued anywhere in Pennsylvania since the carrier conducts business everywhere in Pennsylvania.). It remains to be seen how the Court will respond to this motion. In any event, this same issue remains before the Superior Court in the separate case of Sehl v. Neff which was argued last week on April 27th. I wrote the amicus brief on behalf of the Pennsylvania Defense Institute in favor of the defense position in both of these matters. I will report on any court action that happens in these cases.